The Challenge is simple: Share. Donate. Challenge. 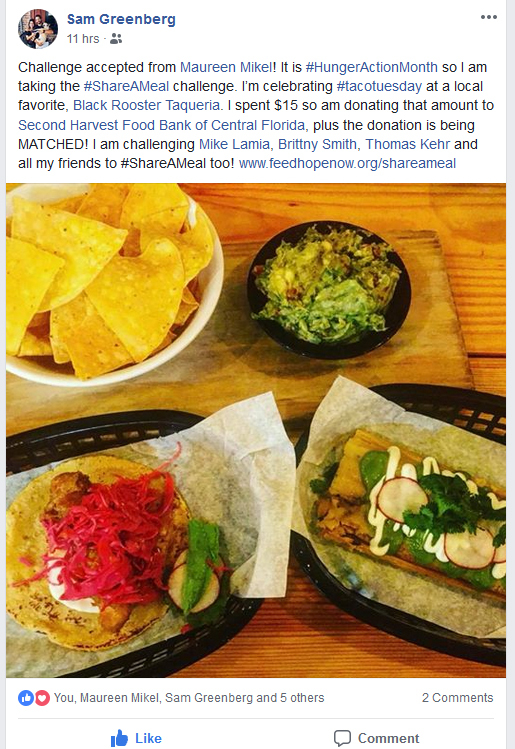 During Hunger Action Month, Second Harvest Food Bank is asking you to take the Share A Meal Challenge and share the gift of hope with the 1 in 6 Central Floridians who struggle with hunger. STEP 1: Share a meal: Share your favorite meal with us using the #shareameal hashtag on social media. STEP 2: Donate what you spent on that meal to help our neighbors in need. Thanks to a special hunger hero, your gift will be matched up to $7,000. STEP 3: Challenge 3 friends by tagging them in your post. I'm accepting the Second Harvest Share a Meal Challenge and I'm donating the cost of this meal to help feed my neighbors in need. Plus, my donation is being matched at http://www.FeedHopeNow.org/ShareAMeal! The Share a Meal Challenge is part of Hunger Action Month. Thank you for helping us to fight hunger in our community.